Thank you for speaking up with poultry workers. Now please share with your friends! 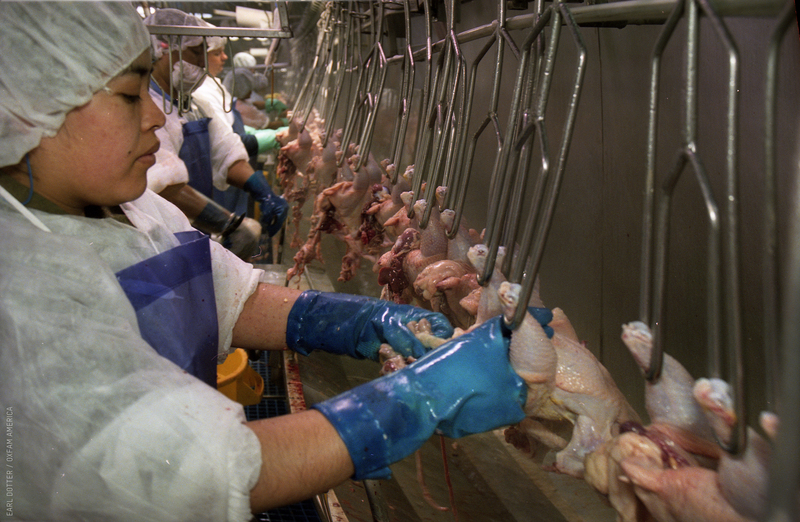 Roughly a quarter of a million people work on the processing line in American poultry plants. As they process the chicken we eat, they face dangerous conditions and poverty-level wages on a daily basis. These problems are industry-wide, but the four biggest poultry companies control nearly 60 percent of the chicken market. As industry leaders, they have the power to make changes to quickly improve conditions for their workers. But they won’t, unless they hear a loud and clear message from oxfam.core.people like you. Please add your name below to demand respect for poultry workers’ rights. A voice in the workplace. Please implement changes throughout your poultry plants and lead the way in ensuring that your workers have the right to safety, opportunity, and dignity in their labor. Provide health insurance coverage for workers and their families. Provide appropriate medical care when workers are injured. Establish a code of conduct that only punishes behavior that is illegal or dangerous, and provide workers a written copy of the discipline system policies. What’s not to love about chicken? Healthy, delicious—and cheap. We eat a lot of it—89 pounds per person each year. Chicken is America’s most popular meat. From nuggets to sandwiches to wings, poultry is a $50-billion industry. But how does all that chicken reach your plate? It’s not easy to turn a live bird into a bucket of buffalo wings. In fact, it takes a lot of work: hanging, cutting, trimming. We’ll show you what the poultry industry doesn’t want you to see, and tell you exactly what you can do to help workers in their struggle. It's possible to raise and process chickens ethically and still run a healthy business. So why is Big Poultry leaving workers behind? The poultry industry is booming. Consumer demand is growing and profits are climbing. Executive compensation is soaring. Even the lives of chickens have begun to improve as consumers have voiced concern for their treatment. But one key part of this rocketing industry has been left behind: the people who work processing poultry. Every day, hundreds of thousands of workers become disposable parts of a large, fast, relentless machine. These women and men stand on the line hour after hour, faced with an endless stream of chicken carcasses. They hang, cut, debone, twist: repeating the same motions tens of thousands of times each shift, with few moments to rest, stretch, or take a bathroom break. This video is a quick overview of the interactive story that follows: what the poultry industry doesn’t want you to see and what poultry workers need you to know. These are demanding jobs—and the industry doesn’t make it any easier for the workers. In fact, Big Poultry treats workers as replaceable cogs in their machine; turnover in poultry plants can reach as high as 100 percent every year. To find workers willing to do these jobs, the poultry industry exploits vulnerable people who have few other options: minorities, immigrants, and refugees—even prisoners. Because of their precarious situations, most workers are afraid to speak out or do anything that might jeopardize their jobs. Big Poultry is keeping some crucial information from you. Many of us choose to eat chicken because we believe it is a healthy and more environmentally friendly source of protein than other meats. And many have spoken out to ensure that the conditions under which chickens are raised are improving. We deserve to know where our food comes from. You need to know what really goes on behind the walls of those poultry plants. So, we collected stories, photos, and video from workers who invited you into their lives to show you what’s wrong and how you can help. The industry squeezes profits and productivity out of these workers. For every dollar spent on McDonald’s McNuggets, only about two cents goes to processing workers. Those workers hang, cut, trim, bread, freeze, and package those chickens—and they get 2 percent of the sale price. Workers throughout the poultry industry face these problems, but four companies control roughly 60 percent of the American market: Tyson Foods, Pilgrim’s, Perdue, and Sanderson Farms. These companies are so big that if they make changes, other companies may follow. Consumers have already pushed Big Poultry to change: Tyson Foods, Pilgrim’s, and Perdue have all recently pledged to phase out the use of antibiotics from their chicken supply chains. People spoke and they listened. They’ll listen again. Demand safe working conditions for poultry workers. The poultry plant of today is a long way from a red barn on a dusty road. It’s now an industrial factory on the edge of a highway, lights blazing and chimneys pumping. These plants operate around the clock to process 8.5 billion chickens a year. Americans now eat three times more chicken than we did 50 years ago. And that means more workers are needed to hang, cut, pull, and trim millions of birds each day. The poultry industry has come a long way. Today it’s a modern model of efficiency and consolidation. Big Poultry has grown from thousands of small farms into an industrial power-house dominated by a handful of companies that control almost everything—from the chickens and feed to the product distribution network. The top four companies control roughly 60 percent of the market. Inside the processing plants, new technologies make it possible to churn through millions of chickens each day. Machines now handle the birds at several stages, but most of the work is still done by hand: from hanging live chickens to cutting wings to trimming skin. Each worker handles thousands of birds every day. The work is rapid, repetitive, and low paying. The injury rate is high, and the atmosphere is oppressive. Today, Americans prefer chicken cut into parts or processed into forms such as tenders, nuggets, or frozen entrées. As our tastes have changed, the processing work has shifted from the home to processing plants. As the industry has grown and changed, so have consumers’ tastes. Not only do we eat a lot more chicken, but 30 years ago, most of us bought our chickens whole. Today, we buy 90 percent as cut-up parts. Each extra processing step means human hands are at work on the line: cutting, pulling, deboning, skinning, and then coating, frying, freezing, and packaging. It’s not a simple task to take a live chicken, and turn it into Perdue Fun Shapes Chicken Breast Nuggets or Pilgrim’s Honey-Dipt Chicken Strips. As demand for these products grows, the pressure on workers grows too. In the drive to keep up productivity, the industry leans on the workers to go ever faster. The maximum speed at which poultry companies can run their processing lines has doubled in the last 35 years, and the poultry industry has been pushing to make the maximum speed even higher. Faster line speed means higher production, and higher profits. But the pace places a greater strain on workers. On the line itself, depending on the job, many workers say they have to process around 35 to 45 birds per minute. This means performing the same task on about one chicken every two seconds: more than 2,000 chickens per hour, more than 14,000 chickens per day. A conservative estimate is that the average worker repeats forceful motions—cutting, pulling, slicing—over 20,000 times per day. As chicken has become big business, all aspects of the industry have been consolidated and enlarged. Thousands of small farms have been absorbed into huge operations. A handful of companies have come to dominate both the poultry market and its supply chain. Today, the top four—Tyson Foods, Pilgrim’s, Perdue, and Sanderson Farms—control roughly 60 percent of the market. 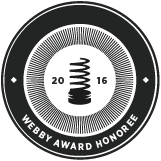 They set the pace for the rest of the industry, including workforce practices. If you buy chicken almost anywhere in the US--in a grocery store, restaurant, or school cafeteria—you are almost certainly buying from one of these companies. The top four companies produce hundreds of different products, and market under at least 30 different brand names. Perdue sells 213 poultry products under their Perdue brand. 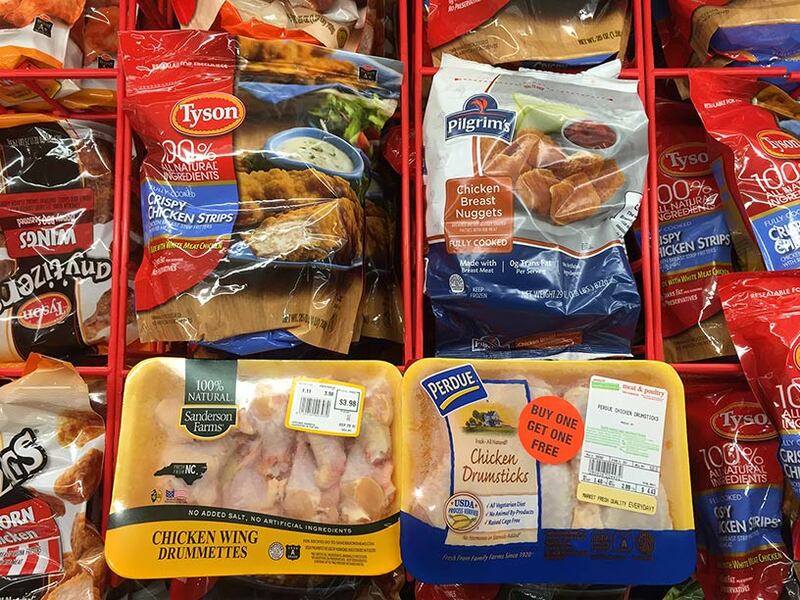 Tyson sells 97 products under their Tyson brand (and many more under other brands), Pilgrim’s sells 54, and Sanderson Farms sells 49 different products. A workers' advocate talks about how large companies can set industry standards. The top four companies produce hundreds of different chicken items and market them under many brand names. If you buy chicken, you’re probably buying from one of these four. Select a brand to find out who's behind your favorite chicken product. In the past 60 years, Big Poultry has become an industrial powerhouse dominated by a handful of companies. The chicken factory of today has one urgent imperative: to take all the live birds that are delivered at the entrance, and process them into chicken products that ship out the exit. Workers are part of this complex machine, and the industry puts pressure on them to work as cheaply, quickly, and quietly as possible. Big Poultry will listen to you, because you buy what they sell. Work on the line is tough—and the industry doesn't make it any easier for the workers. In fact, Big Poultry treats workers as replaceable cogs in its industrial machine. Poultry plants today are large, concrete buildings, surrounded by tall fences and protected by guards. The air around most plants smells like chicken feces and fried chicken. But inside is even worse. 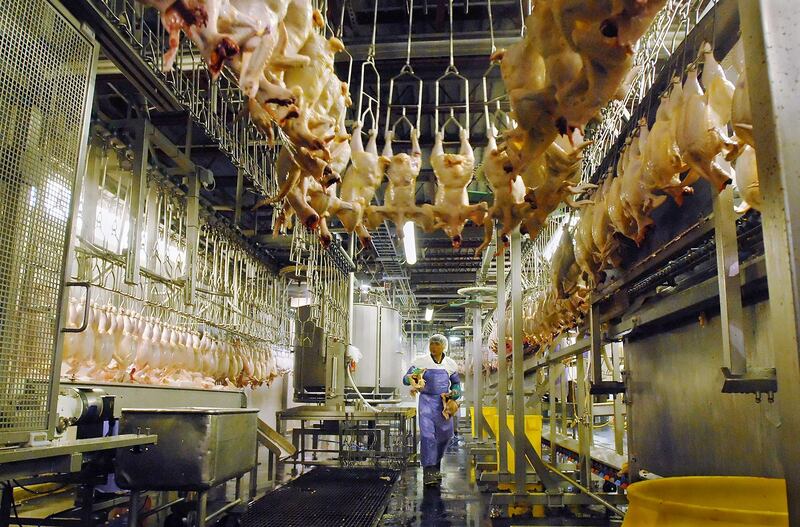 The world inside a poultry plant is not only harsh, but unhealthy. Conditions pose constant dangers to the women and men who work there. You arrive for your shift dressed in bulky clothes. In most plants, the temperature hovers around 40 degrees F. This reduces microbial growth on the chicken carcasses—and it chills workers like you to the bone. The US government's Occupational Health and Safety Administration (OSHA) notes that cold temperatures exacerbate the harmful effects of repetitive motions. You note that it causes your hands to stiffen and makes handling your tools harder. The plant is full of liquids. The birds produce blood, offal, and grease. Cleaning involves water, chlorine, detergent. Sometimes you spend hours on the line standing in a pool of blood. Your supervisor is under pressure to meet his daily production quota, so the line rarely stops or slows down. Each job on the line focuses on one small task, one single part of the bird: wing, leg, breast. So you repeat the same motion tens of thousands of times each shift. You wish you could rotate to different jobs on the line—to rest your muscles, learn new skills, and alleviate monotony. Workers tell you that the company often denies these requests. Almost all workers report that it's nearly impossible to take a break. They have to ask their line supervisor to use the bathroom. The supervisor must in turn find someone to fill that spot. Workers say there are seldom enough of these replacement workers available so they often have to wait an hour or more. Nearly everyone has stories of workers peeing on the line. Still others make the choice to wear diapers to work. Others report that they stop drinking water and become dehydrated. Dolores, who worked at a Simmons plant in Arkansas, said she was denied permission to use the bathroom "many, many times." Her supervisor mocked workers' requests. "He said, 'Ah, but why? I told you... that you shouldn't drink so much water and eat so much food so that you don't need to ask to use the bathroom." She began wearing a sanitary napkin, but since it would fill up with urine too quickly, she resorted to diapers: "I had to wear Pampers. Myself and many, many others had to wear Pampers." She said she felt like she had "no worth, no right to repeal or to speak up." She decided just to endure the situation. "It made me feel ashamed." Every day, more than 30 million chickens are trucked to poultry plants across the US. The birds enter the plant alive and squawking. They leave in packages: as boneless, skinless chicken breasts or frozen nuggets or bags of wings. What happens from entrance to exit involves a lot of work, both automated steps and manual labor. Each step in the process requires a specific job. One person cuts off wings, another pulls off the skin and removes the "tenders," while yet another breads and fries chicken nuggets. Wings, breasts, drumettes, thighs. How many people are needed to process a single chicken? These jobs are difficult and demanding. Workers who are willing to take on the conditions and the challenges should be rewarded with fair compensation and treated with respect and dignity. Instead, the industry treats these workers as disposable, and replaces them as quickly as necessary. Speak up with poultry workers now. Working on the line is exhausting, but workers earn little money or respect for their efforts. The industry treats them as disposable. When workers are injured or disabled, Big Poultry lets them go and brings in new recruits. Poverty wages in a booming industry. Imagine going to work each day knowing you may not be allowed to go to the bathroom for many hours during your shift. You debate wearing an adult diaper because of that. You are likely among the 86 percent of workers who suffer hand and wrist pain because of repeating the same motions 20,000 times each shift. You face another day of the same. Should your pain become chronic, you risk permanent damage to your hands and arms. Company nurses dismiss your concerns, sending you back to work. Still, the pressure to keep up with the speed of the line is unrelenting. And the check at the end of the week barely sustains you and your family. Ask a poultry worker about what happens on the line, and they usually start pointing to places on their body: scars from surgery; marks from cuts, claws, or bites; swollen hands and wrists. Working on the line is working through pain and problems. The US Department of Labor officially classifies poultry as a “hazardous industry” and has calculated that poultry workers are injured five times more than other workers. The industry compounds the danger: increasing line speeds, failing to provide rest breaks, providing inadequate medical care to injured workers, underreporting incidents of injury and illness, and denying responsibility for workers who become injured or disabled. "The meat and poultry industry still has one of the highest rates of injury and illness of any industry." trigger finger (a finger gets stuck in a bent position, and straightens with a snap—like a trigger being pulled and released). Many jobs involve not just repetition, but force: workers need to pull, hack, and twist forcefully. And when tools are not sharp enough, the work requires even more force. Carpal tunnel syndrome is rampant in the poultry industry. Poultry workers suffer it at seven times the rate of other workers. It is not a case of short-term discomfort; as it presents in poultry workers, carpal tunnel syndrome can be a permanent and disabling condition. It often requires surgery and—if not properly treated—can prevent those affected from working. Without the normal use of their hands, these workers are unable to continue earning money to support themselves and their families. Many workers say that when they ask to be transferred to a different position on the line, in order to let their muscles rest, supervisors often deny their requests. "Workers have no control over the speed. They can't stop to rest or take breaks when they want," says Dan Habes, an ergonomics expert at the Centers for Disease Control and Prevention's (CDC) National Institute for Occupational Safety and Health. "Those are all principles of ergonomics: When you're hurting, you should be able to stop and take a break." 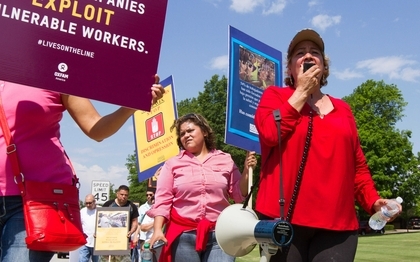 How does work on the line affect workers' health and lives? 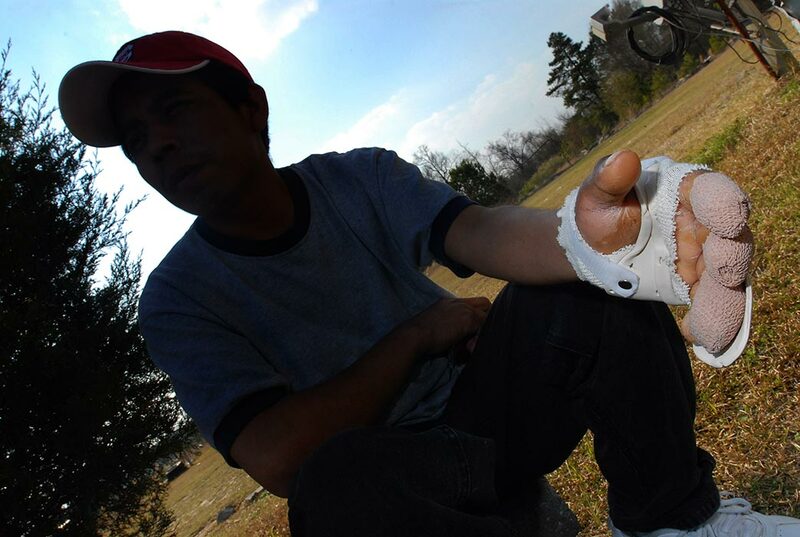 Cuts and lacerations: Many workers tell stories of losing the tips of fingers or whole fingers, or of stabbing themselves in the hand, arm, or leg. Slips, trips, falls: Workers, who often wear heavy rubber boots as part of their protective gear, find it difficult to step on and off work platforms in wet and humid conditions. 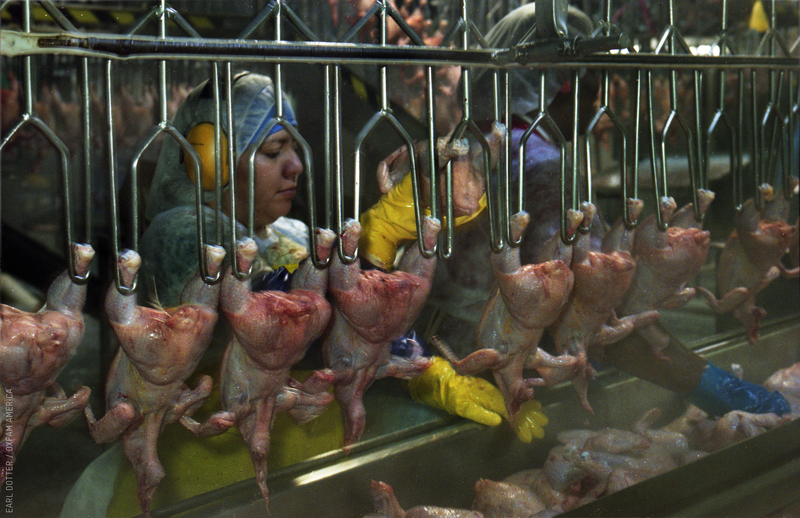 Respiratory hazards: Because of chemicals, dust, and animal waste, poultry workers suffer an array of respiratory problems, from asthma to nausea. 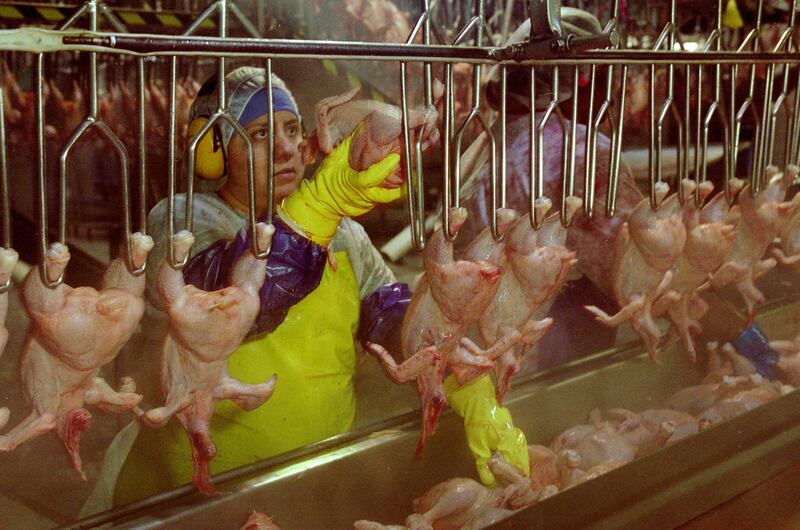 Exposure to dangerous chemicals: Poultry workers are exposed to an array of toxins on the line. Depression: Workers commonly develop depression and anxiety. Among the factors that cause this are social isolation and low social support, abusive supervision, poor compensation and living conditions, hazardous conditions, and job insecurity. One study found that poultry workers from Perdue and other companies in North Carolina suffered depressive symptoms at a rate 80 percent higher than non-poultry workers. "Suddenly the knife went through my hand." Stepping into a spot on the line puts nearly every part of your body at risk. From head to toe, you're surrounded by sharp tools, harsh chemicals, and constant demands to speed up and keep going. This is violating the laws of human decency. Poultry plants are filled with hazards … Production lines where workers stand shoulder-to-shoulder wielding blades for hours with few breaks. Temperatures hover near freezing to prevent the spread of bacteria. Water drips off machinery, falling onto floors slick with chicken fat. 86% of poultry workers in one survey said they suffered hand and wrist pain, swelling, numbness, inability to close hands. Performing the same forceful cutting, hanging, pulling, or trimming motion more than 20,000 times a day can lead to musculoskeletal disorders in poultry workers’ hands, arms, and shoulders. Most surveys reveal that a vast majority of workers experience pain, swelling in the joints, limited range of motion, numbness or tingling sensations, and loss of strength. "The pain I felt, the back pain, the pain in my hand was a sharp pain and hurt with any movements; when I would kneel, when I would bend over, when I twisted from side to side. In reference to my hand, it hurt as soon as I started hanging and moved my hand … after I was diagnosed with carpal tunnel my body started to get stiff. My arms became stiff, my feet very stiff, my legs, and my neck very stiff." Sources: Kerry Hall, Ames Alexander, and Franco Ordoñez, “The Cruelest Cuts,” The Charlotte Observer, September 30, 2008. | Tom Fritzsche, Unsafe at These Speeds: Alabama’s Poultry Industry and Its Disposable Workers (2013). Repetition, force, awkward and static postures lead to musculoskeletal disorders such as carpal tunnel syndrome. 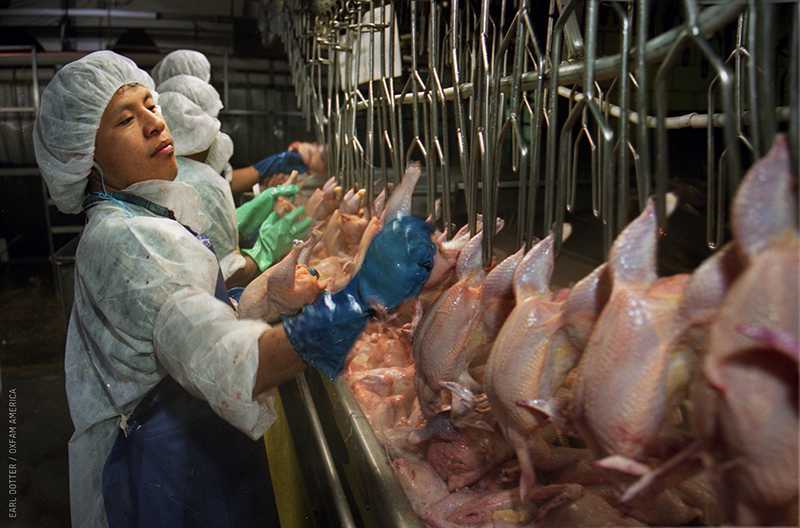 Poultry workers develop Carpal Tunnel Syndrome (CTS) at 7 times the average. Ammonia leaks are not uncommon in poultry plants, and often send workers to the hospital. Exposure to ammonia can result in severe burns to the eyes, skin, throat or lungs. In extreme cases, these burns can be serious enough to cause blindness, lung disease, and even death. "On August 31st 2013 … I was working in packing; there was an ammonia leak. Since then I have breathing problems … my chest tightens suddenly and … it is hard to breathe." Slips and falls are common, as the floors in poultry plants are usually coated with water, blood, or poultry fat and grease. Some people report working while standing in a pool of blood. In the process of handling the flesh of thousands of birds each day, poultry workers absorb enough antibiotics that they develop resistance to them. In one study, poultry workers had 32 times greater odds of being colonized with antibiotic-resistant E. coli than other members of the community. Health experts have reported instances of these workers developing staph infections that are potentially fatal, as they are resistant to treatment. Sources: Johns Hopkins Bloomberg School of Public Health, Dec, 17, 2007. In 2013, poultry workers suffered amputations at 3 times the average for all workers, a higher rate than even in high risk occupations like manufacturing and mining. Many companies provide scant training for workers on health, safety, or proper technique. What instruction workers receive is sometimes offered in a language that cannot be understood by all trainees. * They are then put to work almost immediately. New hires must often assume their position on the line and, while rushing to keep up, watch what other more experienced workers are doing. New workers frequently end up holding or using their tools incorrectly, which can lead to injuries. *Tyson maintains that they conduct safety training in multiple languages. Oxfam was unable to verify this claim with workers, and the information is not public. Workers frequently need medical attention, in and out of the plant. Yet workers say they’re often afraid to speak up when they’re injured or ill. They worry about being disciplined or fired. Those without documentation fear deportation. Supervisors often respond negatively when a worker reports pain or injury, and requests a break to visit the medical office. Many workers say supervisors go so far as to make fun of them for complaining about pain. When workers do have the courage to seek medical care, they are usually referred to medical personnel who work for the company. These people can be more interested in protecting the company than the health of the workers. Plants are concerned about their safety records. They try to minimize medical treatments that would require recording or reporting incidents. This means keeping medical attention at the level of first aid: ibuprofen for pain, compresses for swelling, cream for sore muscles. If companies can avoid doing more than this, they don’t have to record the incident, or report to the US government’s Occupational Health and Safety Administration (OSHA). This keeps their record clean, but also means they mistreat or misdiagnose serious injuries and illnesses. When the condition requires attention from a physician, workers report that they are usually referred to doctors who work closely with the company. These doctors may avoid diagnoses that would make the company responsible. Why doesn’t the US government do more to protect workers? Cumulative injuries can build to the point that a worker can no longer use her hands, arms, or shoulders. And cannot work—at the poultry plant, or another job. Then what? All states have workers' compensation programs that offer support and medical care to employees who suffer work-related injuries or illnesses related to work. However, workers often face significant obstacles to accessing benefits. Poultry companies may argue that the workers’ problems are not related to work, but to another activity. In one case, an employer blamed a repetitive strain injury on a car with manual transmission. Repetitive strain can be difficult to prove. The damage is largely invisible (other than swelling), and only develops over time, rather than as a result of a single traumatic incident. Former poultry worker, Simmons. He had surgery for carpal tunnel syndrome in both hands and is permanently disabled. Who is willing to do these difficult jobs? Mostly people who are economically desperate and socially isolated—in other words, people who have few choices. Many workers and advocates say that the industry takes advantage of these vulnerable populations by creating a climate of fear. Immigrants: Many poultry workers today are from other countries, including Mexico, Guatemala, El Salvador, Peru, Ecuador, Somalia, Laos, the Marshall Islands, Nepal, China, and Haiti. These workers face many challenges in learning about and understanding their rights. While plants often employ both English- and Spanish-speakers, they rarely provide translators for speakers of other languages. The language barrier makes it difficult for workers to communicate with each other and to speak out. 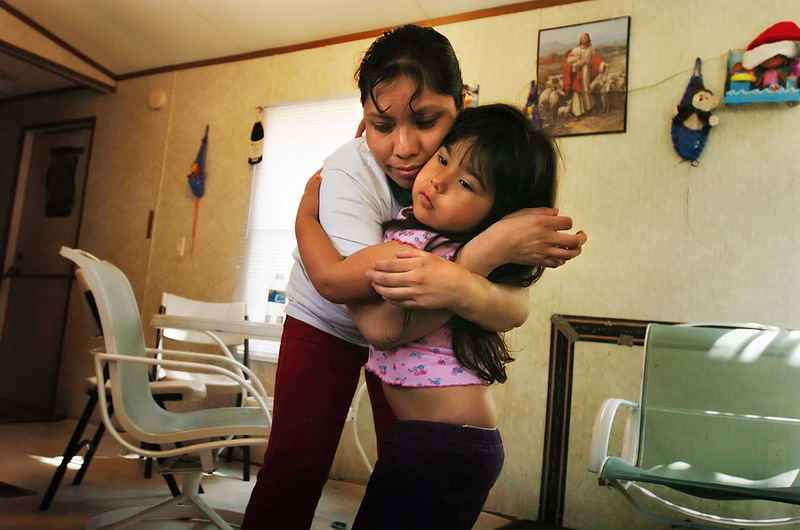 Many workers have tenuous immigration status, which makes them especially vulnerable. They fear deportation, which could put families in the US and in their country of origin at risk. Refugees: In recent years, the poultry industry has been turning to an especially vulnerable population: refugees who come to the US seeking asylum. In a plant in Texas, Pilgrim’s employs refugees from Burma, while other companies employ refugees from Sudan, Iraq, Eritrea, and Somalia. Refugees are apt to be paid even less than other workers because the poultry industry often uses labor contractors to find these refugees; contractors pay wages directly to the workers—usually less than the plant would pay. Poultry companies deliberately take advantage of the demographics of the workforce to create a climate of fear in processing plants. Some workers say their supervisors are fair, but many workers report that the supervisors—under intense pressure to keep up with production—push line workers to excess. There are frequent reports of rough, or even abusive, tactics. Many workers report that their requests for bathroom breaks are denied. Still others report that they are chastised or derided when they bring injuries or illnesses to their supervisor’s attention. * Tyson says they have policies that prohibit retaliating against workers for any reason and that they employ staff to help injured employees receive proper medical care, however Oxfam’s research shows these policies are not being implemented properly. 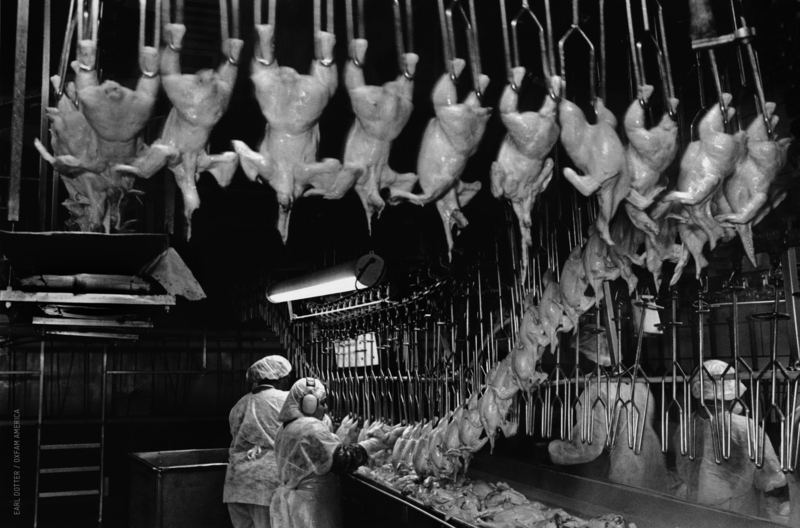 Point system: In the effort to control the workforce, many poultry plants use a “point system” to track tardiness, absences, mistakes—even injuries. When the company wants to penalize or dismiss a worker, it can refer to the points, with no other explanation. Supervisors rarely explain or document the system; many workers don’t know how many points they have or how close they are to being fired. So workers live in fear of points, of doing the wrong thing and being fired without warning. Bathroom breaks: Many workers are afraid to ask for permission to go to the bathroom. The supervisor, who needs to find a replacement worker to fill the spot, may yell, penalize, or threaten firing. The long waits are especially hard for some workers, including those who are older or pregnant. Some workers take the step of reducing their intake of fluids. 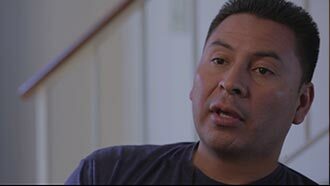 Pedro, a former poultry worker for Tyson, simply stopped drinking water: “I figured if I don't drink that much, I won't need to use the bathroom a lot.” He became sufficiently dehydrated that his potassium levels dropped, causing severe leg cramps. Other workers choose to wear diapers to work. Tyson disputes this, claiming their policies require rest breaks (including permission to leave the line to use the restroom). 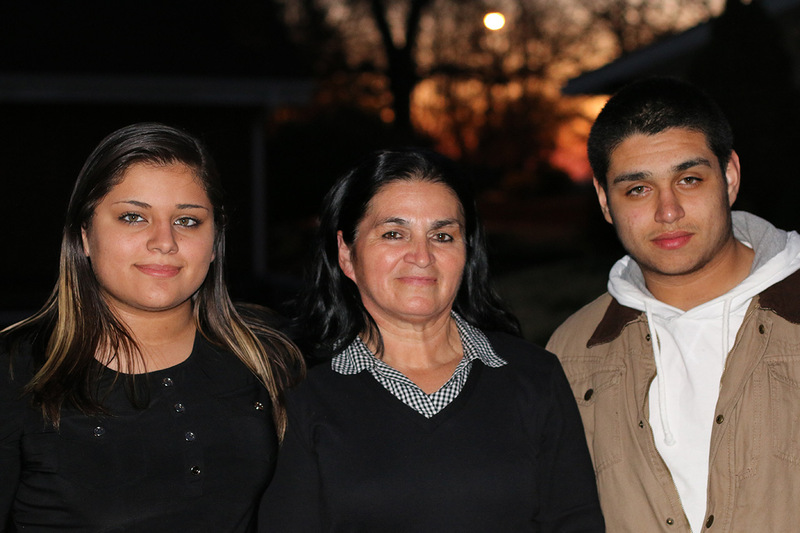 Fear of losing jobs: Many poultry workers come to the US to support families back home. Their parents and relatives depend on them, and workers report deep pain when they can’t provide that support. Consequently workers are terrified of losing their jobs on the line. While the poultry industry is profiting, workers are not. They earn low wages, have scant benefits, and have little, if any, job security. None of the workers interviewed by Oxfam reported receiving any paid time off. Most poultry workers earn wages that leave them close to the poverty line. Wages average around $11 per hour; annual full-time income is $20,000 to $25,000. The average poultry worker supporting a family of four lives below the poverty line and qualifies for food stamps, Head Start, and the National School Lunch Program. And wages do not keep up with inflation; over the past 30 years, the real value of poultry workers’ wages has declined almost 40 percent. The CEO and chairman of Sanderson Farms received $5.9 million in compensation in 2014, a nearly 200 percent increase since 2011. The President and CEO of Tyson Foods earned $12.2 million in 2014: 550 times what the average poultry worker makes. Perhaps more stark, in three and a half hours, he earned the annual salary of a line worker. 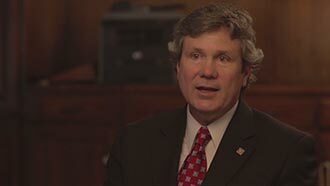 The President and CEO of Pilgrim’s has seen his compensation rise 290 percent to $9.3 million since 2011. Most plants do not offer substantial raises, even to workers who’ve been there for years. Perdue workers in Maryland reported still earning barely $11 per hour, even after years on the job. "This is an injustice what they are doing." "While the real value of poultry workers’ wages has dropped to poverty level, compensation for executives has skyrocketed. 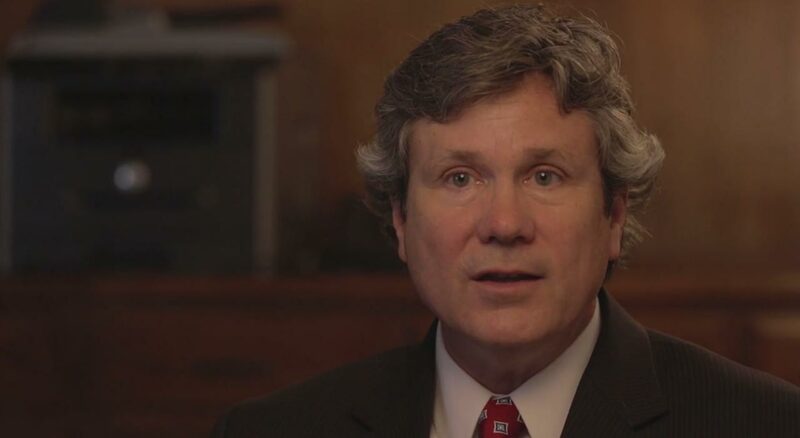 The CEO of Pilgrim’s earned over $9 million in 2014. In just five hours, he earned the annual salary of a line worker." Many plants chip away at workers’ pay. 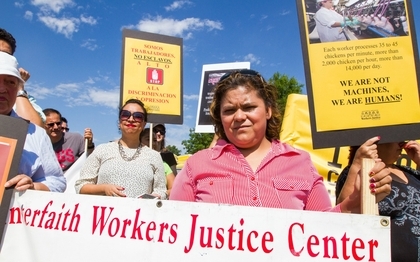 Wage theft: Wage theft is common in the poultry industry. For example, workers are rarely paid for the time they spend preparing for and finishing up after work. In one survey, the Department of Labor found that 100 percent of poultry companies were out of compliance with compensation requirements for “donning and doffing” (putting on and taking off pieces of safety gear) and lunch periods. In 2010, Pilgrim’s paid over $1 million in back wages to workers at a Dallas plant for overtime and “donning and doffing.” In 2008, Sanderson paid over $2.6 million in back wages to workers they had not paid properly for time they had worked. In most plants, workers stay on the line until all the chickens are processed. While many work more than 40 hours a week, reports of overtime pay are rare. Questionable accounting practices: Some companies are now paying workers with debit cards. The cards may force workers to pay a fee (which is illegal), and require workers to go online to find out how much is on the card. Other plants decline to provide workers with paystubs. These practices make it difficult for workers to gather the evidence they would need to file a wage violation complaint. Paying for protective equipment: Workers are sometimes required to buy their own safety equipment; Perdue workers at plants in Maryland and Delaware report having to pay for their own boots, gloves, aprons, and goggles. In one study, 96.9 percent of the workers were required to either purchase or pay for replacements. Tyson Foods pledges to provide employees with adequate work-related gear at no cost but they do not specify the quality of the equipment or a replacement policy. Many workers say they receive health insurance through their employer, however they may be charged $20 to $30 per week for it and it covers only themselves—not their family members. None of the workers interviewed by Oxfam or others report getting any paid time off. No sick days, personal days, vacation days. Indeed, many workers talk about working through illness, and the problems this poses in the plant. Many women talk about how difficult it is to work while pregnant—especially the stress of no bathroom breaks. And there is no paid maternity leave; many return to work shortly after giving birth. Big Poultry treats workers as disposable parts. The industry churns through people, exploiting marginalized and vulnerable populations to do the work. It doesn’t have to be this way. The industry could treat the workers with respect and care. It could bring benefits to the industry as well as the workers: a more stable, educated workforce committed to safety and best practices. You have the power as a consumer to speak out to the giant companies. Every day, thousands of people head to work in a thriving industry. They process the chicken that lands on our plates in homes, schools, and restaurants. But these people—poultry workers—do not share in the bounty. Instead, they earn poverty-level wages, suffer debilitating injuries, and experience a climate of fear. 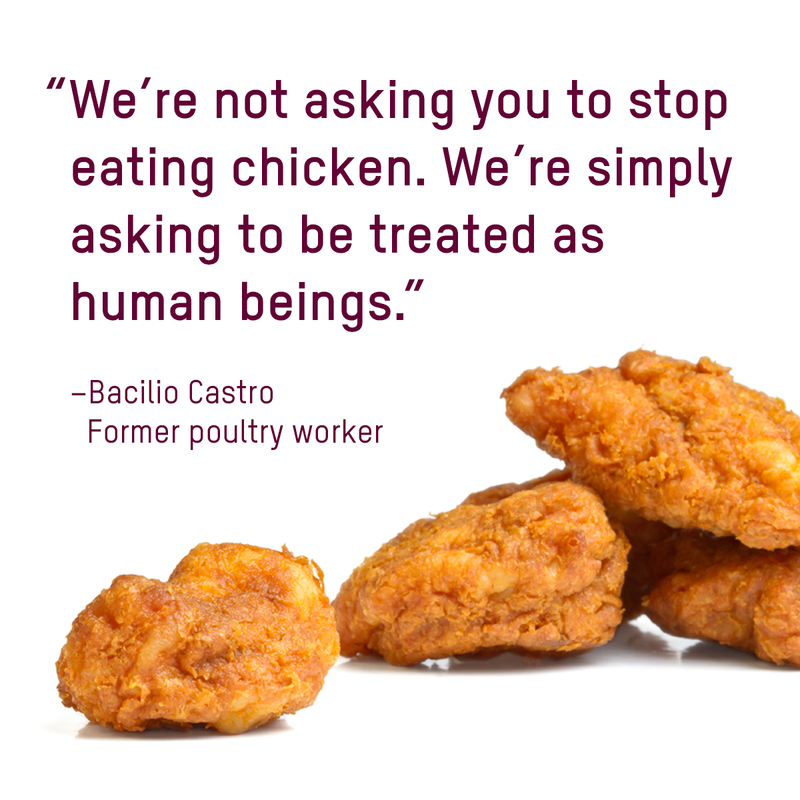 You can speak out to the giant companies: Tell Big Poultry to treat their workers with respect and dignity. Big Poultry can and should implement changes that would quickly improve conditions for these workers. The top four can lead the way. Tyson Foods, Pilgrim’s, Perdue, and Sanderson Farms together employ over 100,000 poultry processing workers and control almost 60 percent of the market. The entire poultry industry employs practices that exploit their workers, but these four companies, as industry leaders, have the ability to make changes across the entire poultry industry. Should we all stop eating chicken? You've heard about the problem. Is giving up chicken the solution? Now you know more about what goes on behind the walls of those poultry plants. Poultry workers and others have tried to influence the industry but Big Poultry has failed to make a commitment to workers. So what will it take? Tyson Foods, Pilgrim’s, Perdue, and Sanderson Farms may not listen to workers but they care what you think. Consumers have already pushed Big Poultry to change: Tyson Foods, Pilgrim’s, and Perdue have all recently pledged to phase out the use of antibiotics from their chicken supply chain. People spoke and they listened. They’ll listen again. Take action now. 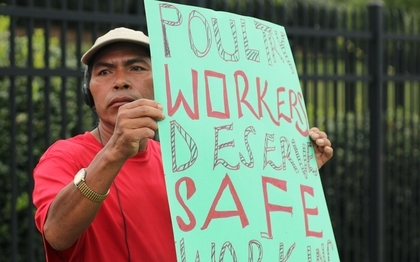 Fear has kept many poultry workers silent. You don’t have to be. © 2015 Oxfam America Inc. All rights reserved. How does the chicken you eat get to you? There is growing public awareness of the treatment of animals in our food chain, but sometimes the treatment of workers attracts less public attention. This site is the result of research conducted by Oxfam on poultry workers in the US. We collected stories, photos, and video from these workers—women and men who want you to understand what’s wrong with the industry and how you can help them. Most of the workers interviewed by Oxfam requested the use of pseudonyms out of fear of retribution. We have included related details about their jobs and plants where they worked, but have omitted locations in most cases to offer some privacy. Many workers generously agreed to be interviewed, and/or photographed and filmed with the explicit goal of sharing their stories and experiences with the public. If workers were concerned about the consequences to themselves and their families if they spoke publicly, we offered to conceal their identities further by filming them back-lit or showing only their hands. Oxfam America conducted research on the poultry industry from 2013 to 2015. The research entailed literature and primary document review and interviews to provide an empirical description of the status of poultry processing workers in the current context of the US poultry sector. Oxfam staff traveled to Arkansas, North Carolina, and Mississippi to conduct dozens of semi-structured interviews with current and former workers, worker advocates, attorneys, medical experts, analysts, and others in the communities. The research also benefits from work conducted by government agencies and non-profits over many years; in all, they surveyed over a thousand current and former poultry workers. In addition, our research team reviewed more than 200 works about the industry, from books to medical research. Still, a great deal of information about the industry remains unavailable (e.g., compensation and demographics). Oxfam America reached out to all companies named in this report to share the findings of our research and engage them in dialogue about solutions. Tyson Foods and Perdue are the only companies that responded. They cited a number of policies (some public and some not) that address issues raised in Oxfam's report. The full report incorporates that feedback. TYSON FOODS is the only top poultry company to have a Team Members’ Bill of Rights. In this document, the company commits to a safe workplace and to maintaining safety committees that include hourly employees. Tyson also commits to upholding several rights for workers: to file complaints with the plant safety committee without fear of reprisal; to claim existing state and federal benefits; to be free from discrimination and retaliation; to compensation for work performed; to information (including the Bill of Rights and Code of Conduct), and to understand the information being provided; to choose to join together for collective bargaining; to continuing training; and to adequate equipment at no cost. Tyson’s Code of Conduct elaborates further, including a pledge to provide “reasonable time for necessary restroom breaks” during production shifts and to uphold the principles of human rights. According to Tyson’s workplace safety policy on its website, all employees are to receive detailed safety training during orientation, as well as continued training, in multiple languages. Tyson maintains that many of their facilities have safety and ergonomic committees and include full-time safety managers and occupational health nurses. All Tyson employees receive health insurance, but hourly workers do not receive paid sick leave. Tyson Foods informed Oxfam they had commissioned a wage survey that found they pay wages which exceed those of their competitors in the poultry industry. However, Oxfam could not verify the results of the survey. Tyson also stated that they employ industrial engineers to determine appropriate speed and staffing of production lines, with safety as a key factor. This practice is not public, nor are the standards used to set staffing and line speed. Finally, Tyson stated that facility management teams conduct annual reviews to measure injury and illness rates, average lost and restricted days per case, workers’ compensation costs, absenteeism rate, and turnover, among other factors. This information is not made publicly available, so Oxfam was unable to examine the methods employed, the standards used, or the data collected. Oxfam’s research revealed conditions that do not meet Tyson’s publicly stated standards and policies. We conducted interviews with Tyson workers in multiple states, and reviewed records of documented labor violations in Tyson plants. 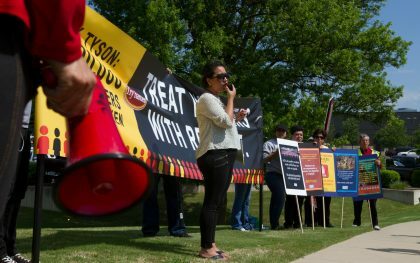 Tyson workers consistently reported conditions that contradict Tyson policy, including, but not limited to, supervisors refusing to grant restroom breaks, workers enduring hazardous and unsafe work conditions, and workers afraid to speak out or use the hotline due to fear of reprisal. Even at Tyson’s reported wage levels, many of their workers earn wages that leave them near the poverty line. Tyson has also been officially sanctioned by governmental agencies on multiple occasions for failing to pay workers appropriately and for safety violations. While some of Tyson’s policies on workers’ rights are ahead of industry counterparts, they still fall short in key areas, such as paid sick leave and fair compensation. But, more crucially, it is impossible to verify their policies in practice using publicly available data. For example, in Tyson Foods Sustainability Highlights for FY 2014, they cite a “10% reduction in the Total OSHA Recordable Incident Rate” since FY13; but there is no supporting information. Tyson’s internal audits are not sufficient to judge whether their publicly stated policies are being followed. The audits are limited to health and safety, rather than the full set of rights enumerated in the Bill of Rights. The audits are conducted by Tyson corporate employees, rather than independent third parties. Since the results of these audits are not made public, it is not possible to judge their efficacy. Tyson’s policies on workers’ rights lack effective measurement and transparency reporting, making meaningful accountability at the individual plant and worker level difficult to achieve and impossible to assess. Tyson issued a formal response to Oxfam’s report, which can be found on Oxfam America's website. PILGRIM’S claims to have released its first Corporate Responsibility report in an Investor Relations press release from 2012. However, the report has since become unavailable, and its new Corporate Responsibility page does not mention any commitments to their workers on any issues regarding compensation, health and safety, or workers’ rights. Perdue issued a formal response to Oxfam’s report, which can be found on Oxfam America's website. SANDERSON FARMS publishes a corporate responsibility report every year. The focus is almost entirely on environmental responsibility and improving energy, packaging, and water use. There is no mention of workers or health and safety. Sanderson Farms sent a statement in opposition to Oxfam’s shareholder resolution concerning transparency in occupational health and safety. The statement includes information about worker health and safety in their operations. You can find the statement here. We are profoundly grateful to the workers who were willing to talk honestly and openly about their experiences in the poultry industry with us. They showed great courage and grace under pressure. Our thanks to Earl Dotter for photography where noted. Our thanks to John D. Simmons/The Charlotte Observer for photography where noted. Oxfam gratefully acknowledges the work that Brother David Henley, a member of Glenmary Home Missioners, has done to publicize the issue of conditions within poultry plants. Because very little footage exists publicly of what it looks like inside the plants, and Oxfam did not have access, we are deeply grateful to Gabriela Solis and Karina Oliva who agreed to let us use the footage from within the plants that they shot when they were journalism students. Although they shot this footage in December 2008, current and former workers agree that this is an accurate representation of current work conditions on the line. Our thanks to Jimena Vallejo for some last minute translations. Striffler, Steve. Chicken: The Dangerous Transformation of America’s Favorite Food . New Haven, CT: Yale University Press, 2007. Why is Oxfam—an international humanitarian and development organization—talking about poultry workers in the US? Oxfam’s mission is to support the efforts of people around the world who are working to lift themselves out of poverty. For some years, Oxfam has had a US program that addresses the challenges that food workers—primarily farm workers—face. It’s important to examine the supply chain in our food system, and to consider the men and women who grow, harvest, and process America’s food. 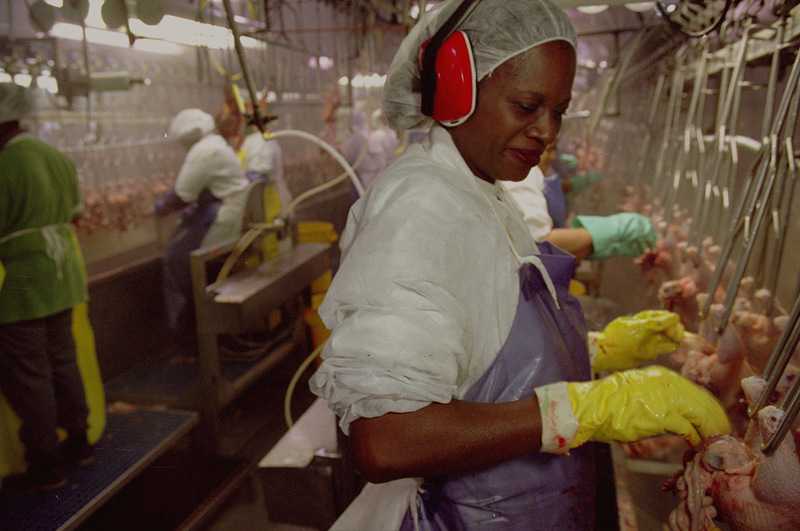 Poultry workers play a central role in producing the US’s most popular meat. Oxfam’s involvement, however, is not just about identifying a need. We focus our efforts where we feel there is both a need and where our particular skills present an opportunity to make a difference. In recent years—engaging companies from Starbucks to Coca-Cola—Oxfam has gained credibility in our work assessing corporate impact on vulnerable communities and then mobilizing the public to encourage companies to have a positive social impact. We believe that if the US public understood what poultry industry watchdogs have known for years that this issue would finally attract the broad attention it deserves, and the public would hold companies accountable. Do these issues affect organic, free range chickens? Many consumers make the choice to purchase organic or free-range chicken. These choices offer potential benefits to the health and well-being of both chickens and consumers (fewer chemicals for both, more humane treatment for pasture-based or free range birds). These choices, however, have little to do with what happens next: how chickens are processed. Once chickens reach a poultry processing plant, most still go through the stages outlined on this site; most workers still perform their tasks by hand in the same conditions described. Some of the small businesses and companies that specialize in organic or free-range chickens do process their birds under different conditions. That said, some of the most popular organic and natural brands—such as Coleman Organic—are owned by the four top companies. And their chickens are processed just the way we’ve described here. So should I stop eating chicken? That is not what Oxfam is calling for. Our hope is that all of us who eat chicken will recognize our power as consumers to influence the industry—and to use our influence. These companies survive because of our choices. They care very much what we think. As for eating chicken or not, that is a personal choice. We each decide what matters to us when we choose our food. We may exclude meat or eat only organic, or vegan, or fair trade. The choice is yours, but Oxfam firmly believes that you deserve to know enough to make informed choices. If you’re going to eat meat, you need to know what goes on behind the scenes—not only how the animals are treated, but how workers are treated in raising and processing our food. We believe the industry exploits workers by treating them as disposable parts of the production process, but Big Poultry can produce healthy food ethically and profitably. We know that the industry can implement changes that will make it possible to work on the processing line without suffering. Poultry processing is difficult work, but it doesn’t need to be dangerous or undignified. Oxfam is asking that Big Poultry enable hard-working people to live well, support their families, and enjoy the bounty of the industry. Then, what can consumers do? Consumers have become increasingly aware of where their food comes from and how it gets to their table. This has happened more recently in the poultry industry, where consumers have begun to speak out about the safety of their food and the treatment of chickens. 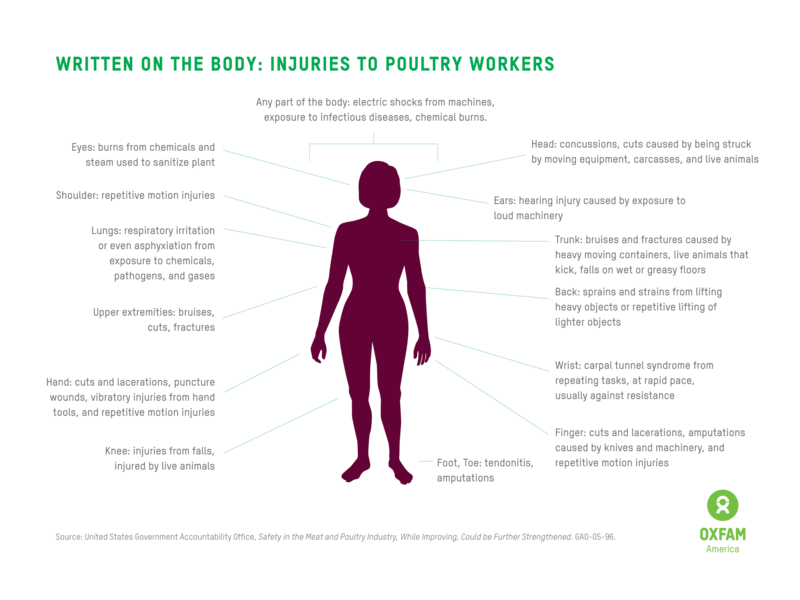 Oxfam is urging consumers to let poultry companies know that consumers care about how workers are treated. Consumers can sign the petition, available at oxfamamerica.org/livesontheline. Then they can share Oxfam’s story with their family, friends, and colleagues and urge them to learn more and sign the petition too. Thanks to the efforts of thousands of people like you, we are making important strides to hold Big Poultry accountable and get them to improve working conditions and compensation for their workers. See below for exciting updates on our campaign. For years, Oxfam has been working with a broad coalition of organizations to pressure the poultry industry to make changes in the way it treats processing workers. A “disfiguring” amputation at a Tyson plant in Texas led OSHA to discover the nation’s largest poultry company endangers workers by exposing them unnecessarily to serious hazards. Last week, OSHA released findings from an investigation into a plant in Florida, owned by Pilgrim’s Pride, the second largest poultry company in the country. They found 14 “serious” violations and several less than serious. Oxfam’s mission is to support the efforts of people around the world who are working to lift themselves out of poverty. This includes people in our own country who are struggling to stay afloat in an increasingly unequal economy. Poultry workers need you to continue to spread the word about life inside America's poultry plants, so we've compiled answers to some of your most frequently asked questions. "New campaign exposes widespread abuses of workers in America's poultry industry"
These YouTube videos are available to embed in conjunction with stories about this campaign and website. These high-resolution photos and graphics are available to use in conjunction with stories about this campaign and website.  Download Oxfam America logos for use in news stories and blog posts. Pedro informed the plant managers about his injuries. He requested a different position and asked the company to consider workers’ compensation. They refused his requests and threatened to fire him. After four years, Pedro was fired with little explanation. He believes he was dismissed because he was trying to educate others about their rights. Tyson questions this account. They say their corporate policies require rest breaks (including permission to leave the line to use the restroom or sharpen knives) and commit to non-retaliation. Isabella says that her time working in the poultry industry “opened her eyes” to discrimination, racism, and the rights of workers. Since she was supporting her family back home as well as her children, Isabella struggled to earn enough. In addition to working full-time at the plant, she started her own business cooking meals for people in town. For nearly eight years, she worked on the line. Supervisors regularly denied bathroom breaks to workers—even to pregnant women. The plant was extremely cold and the chemicals were overwhelming. She developed a problem with her shoulder that still limits her movement. She was fired one day out of the blue. The company said that they had suddenly noticed that her documentation was not in order. Isabella believes they fired her because she had become more aware of her rights, and was standing up for herself. After moving to Arkansas from Mexico, Roberto spent two years as a chicken “hanger” on the line; thousands of times a day, he lifted birds and inserted their feet into shackles. After an injury, he struggled for months. The plant medical staff “just kept prescribing more medicine and told me to increase the dosage and use it more often.” Eventually, the doctor said that working so long without proper medical care had led to carpal tunnel syndrome in both hands. In response to myriad reports and surveys about shocking injury rates, the poultry industry usually responds with this chart. The National Chicken Council created it to illustrate what they call “the enormous progress the industry has made in improving safety for its workforce” in the past 20 years. The situation is far more complicated than the chart would lead you to believe. The dramatic drop in injuries pictured does not only reflect safety improvements; it is largely due to other factors. Workers are still getting hurt, but those injuries are not getting reported. The rules about reporting incidents have changed. In 2002, a new form eliminated the column for repetitive strain injuries. This new form dramatically (and falsely) lowered the reporting of the incident rate. Incidents are underreported. Plants use a variety of tactics to discourage workers, supervisors, and medical personnel from reporting incidents. These tactics may be positive (rewards) or negative (disciplinary actions). 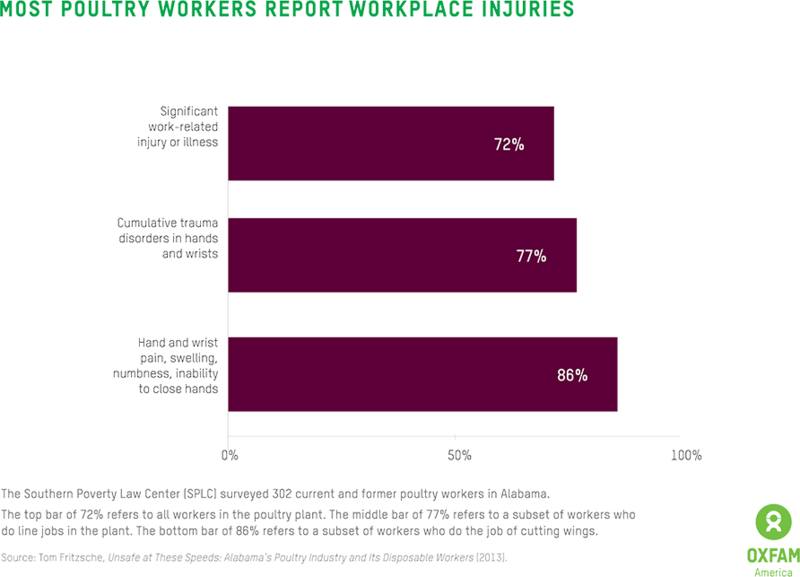 The result is that many workers simply do not report injuries or seek care. One survey reported that 66 percent of workers were scared or reluctant to report injuries; 78 percent attributed this reluctance to fear of being fired. Source: National Chicken Council, “Poultry Industry Continues to Improve Worker Safety Record,” November 8, 2012, http://www.nationalchickencouncil.org/poultry-industry-continues-to-improve-worker-safety-record/. Albious Latior, originally from the Marshall Islands in the South Pacific, works with poultry workers through the Northwest Arkansas Workers’ Justice Center in Springdale, AR. 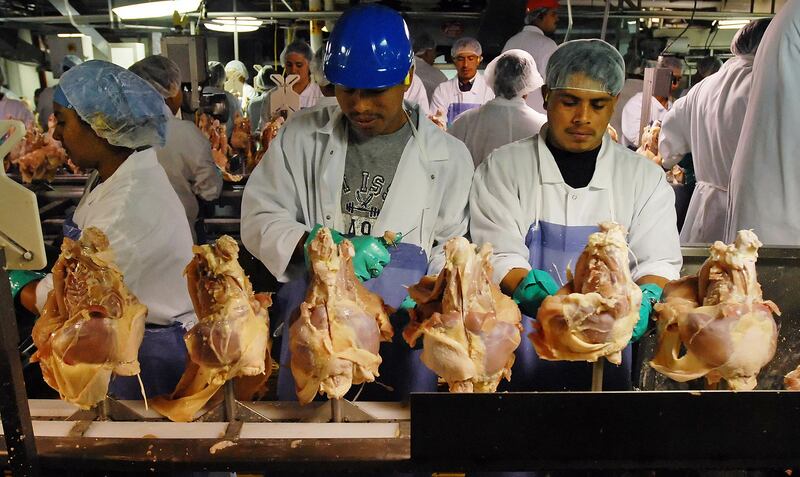 When Marshallese natives arrive in the US, they are eager to work and typically head to poultry plants in Arkansas. As a result, Arkansas has the largest population of Marshallese outside their own country. While the Marshallese may live, work, and study in the US, they must pay also taxes and are denied benefits such as Medicare and Medicaid. As a staff attorney at Arkansas Legal Services Partnership, Mary Goff met hundreds of poultry workers who were struggling to survive the industry intact, while taking care of their families. Sexual discrimination, and discrimination based on national origin, religion, disability. Like many Hmong immigrants, Spencer Lo moved from Laos to North Carolina to work in the furniture industry. He says the weather reminds them of home, and the jobs are steady. Lo estimates that the Hmong population in North Carolina is about 20,000. When the furniture factories closed, many of the workers felt stranded—especially because, Lo says, many are uneducated and speak little English. So a large percentage of the Hmong turned to the poultry plants in Morganton and Wilkesboro. Lo admits that he couldn’t handle the speed of the line and the slippery plant conditions. Today, he works as an organizer and advocate for poultry workers from Laos, the Marshall Islands, and Latin America. Jose was drawn to a Pilgrim’s poultry plant when he saw an ad in a newspaper in Puerto Rico. A labor contractor promised good wages and cheap accommodations. 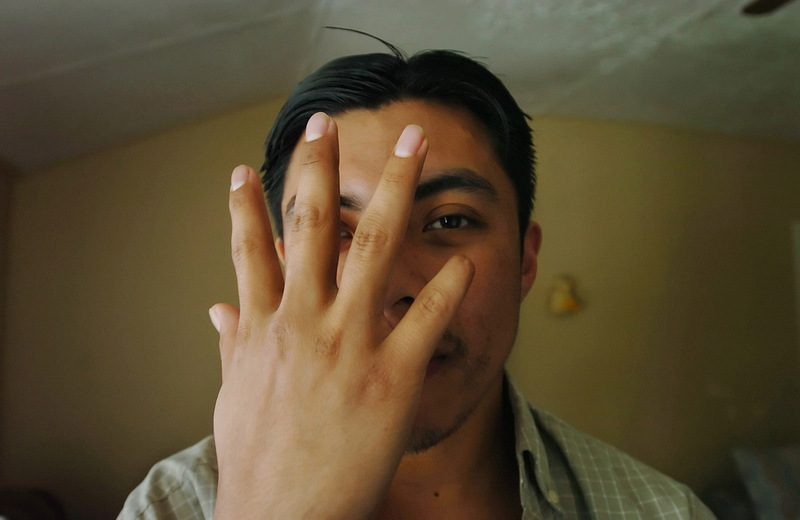 Jorge came to the US for a better future, but he found that most of the promises were, in the words of his plant supervisor, “una mentira” (a lie). Increasingly, poultry companies are using labor contractors to solve workforce problems. Unfortunately, contractors offer few benefits to workers. 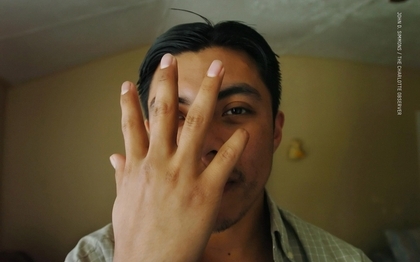 Jose found he was sharing an apartment with several other workers. His bed reeked of urine, and his rent was over 40 percent more than advertised. In addition, the contractor charged $20 a week for gas (for transportation to work). And the hourly wage was $8.40—not the $11.25 he’d been promised. Although Jose was never late or absent, and completed all his work, he was eventually fired—and evicted from his apartment. Line loaders remove the cages and unload the chickens onto conveyor belts. Hangers lift the birds from the belt one by one, and insert the feet into continuously moving shackles overhead. Automated stages: In most plants, the hanging birds are stunned, then decapitated by machine. The carcasses go through scalding tanks, then machines beat the feathers off. The head, feet, and tail are removed to allow automated evisceration; the carcasses are washed and chilled. Cone Line Feeders remove the carcasses from the hanging line and insert them onto cones on a conveyor belt. Wing Cutters lift each wing up, then use scissors to cut the wing off the carcass. Leg/Thigh Cutters use knives, scissors, and/or saws to remove legs and thighs. Back/Breast Separators tug and cut to separate breast and tenders from the back of the bird. De-Boners/Trimmers/Cleanup Workers use knives to remove bone (or fat or skin) from various pieces of the bird, to carve out a “meat only” product. Packagers place product in a package, and into a shipping box. Miscellaneous Processors produce such things as nuggets, sausages, seasoned entrees. We each decide what matters to us when we choose our food. We may exclude meat or eat only organic, or vegan, or fair trade. The choice is yours, but you deserve to know enough to make informed choices. If you’re going to eat chicken, you need to consider what goes on behind the scenes; how not only the animals but workers are treated in raising and processing our food. We believe the industry exploits workers by treating them as a disposable part of the production process. But we also know that this can change. The poultry industry can implement changes that will make it possible to work on the processing line without suffering. Big Poultry can produce healthy food ethically and profitably. Any type of work can have dignity and merit. Poultry workers do vital jobs that bring food to our tables. These jobs are arduous, but they don’t need to be dangerous and undignified. What we’re asking is that these jobs enable hard-working people to live well, support their families, and enjoy the bounty of the industry. The US government’s Occupational Health and Safety Administration (OSHA) openly acknowledges that the poultry industry poses dangers for workers every day. However, the agency does not have specific safety standards for the poultry industry; and it is woefully understaffed and underfunded. The agency has enough personnel to inspect just 1 percent of all workplaces in the US each year. Even when OSHA does inspect a plant and finds violations, penalties are weak and fines low. It may be cheaper for a company to run an unsafe plant and pay minuscule fines, than to take measures to protect workers. 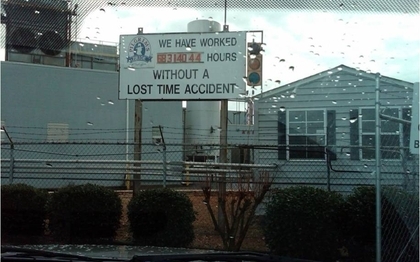 In one example, in 2011, a Perdue plant in Virginia was found to have committed 12 safety violations, including six that OSHA classified as “serious,” yet the company was only fined $6,000, which was negotiated down to just $4,000. In another example, OSHA recently named Pilgrim’s to their “Severe Violator” program, which is designed for companies that have repeatedly violated health and safety laws. Yet despite its record, Pilgrim’s has faced only $300,000 in fines since 2011, a miniscule amount for a company with over $700 million in profits in 2014 alone. Bacilio sought help. “I went to a Catholic church and they told me about a worker’s center.” He began taking trainings and volunteering there. 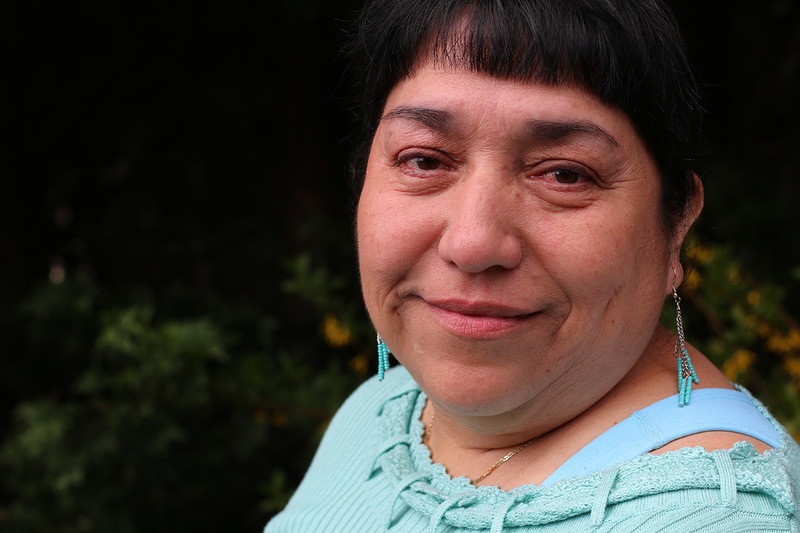 Myrna traveled from Mexico to the US as a young woman. Over the course of 12 years trimming chicken at a Simmons plant in Arkansas, she witnessed a lot of injustice, but was afraid to speak out for fear of losing her job.